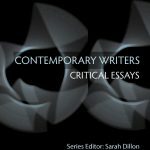 On Thursday 8th December 2016 from 6.30-9pm the Centre for Contemporary Literature at Birkbeck, University of London, will kindly host the book launch for three new titles in Dr Sarah Dillon’s Contemporary Writers: Critical Essays book series with the publisher Gylphi. The titles in the Series are devoted to contemporary Anglophone writers whose work is popularly and critically valued but on whom a significant body of academic criticism has yet to be established. Each of the titles in the Series develops out of the best contributions to an international conference; represents the most intelligent and provocative material in current thinking about the writer’s work; and suggests future avenues of thought, comparison and analysis. With each title prefaced by an author foreword, the Series embraces the challenges of writing on living authors and provides the foundation stones for future critical work on our most significant contemporary writers. The Series already includes titles on David Mitchell, Maggie Gee, and China Miéville. The December launch will celebrate the publication of three further titles, on Adam Roberts, Rupert Thomson and Tom McCarthy. Details of the Launch and free tickets can be found here. All are welcome to come for drinks to celebrate with the volume editors and contributors, and with the Series Editor, Dr Sarah Dillon.